Zach&apos;s 9th Birthday Party at SunSplash, a local water park. Zachary turned 9 on May 22, but we celebrated it today with a party for his friends at SunSplash. First of all, let me say that we love Zach's friends. It isn't a surprise that he has picked well-behaved, considerate kids to be his friends; but it is definitely gratifying. Zach had seven guests, who arrived around 11 am for play and pizza. Zach's mother, my daughter Jenny, had very cleverly figured that it would be a lot cheaper to have the pizza at home than at SunSplash, where food prices would require a mortgage. Everyone sat primly to eat his pizza. Clockwise from top: Jason, Zach, Steven, Tony. Okay, they didn't really. But they had fun and didn't destroy any furniture. It was tricky, though, to try and get pictures of them all in which none of the kids turned out blurry. Then they all piled into the SUV for me to drive to the park, while the other adults got to ride in the comfort and quiet of the other car. That wasn't a problem; I just turned the stereo up loud and ignored the chorus of "I'm telling!" coming from the back seats. Fortunately, it was only a half-hour ride. We had worried about the weather. Last weekend the temperature hit triple digits; but Friday it rained (rained! in the desert!) and the temperature dropped to the 60s! Today it was only in the mid 80s, but that turned out to be perfect—not too hot, and not too cold to swim. SunSplash is pretty cool. There is plenty to divert the children, even non-swimmers. We had one of those with us, Chris' cousin Peter, but he simply put on a life vest and joined in the fun. Chris and his cousin, Peter, with a life vest. 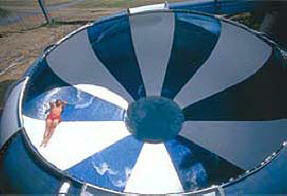 There was a whole pool designed to appeal to kids of just Zach's age. It had a fun but mild waterslide as well as "lily pads" that challenged the kids to walk across. There were ropes to assist, but of course the kids quickly learned to simply run across. For the adults, there was the "Lazy River" which circles most of the other pools and allows bathers to quietly float on inner tubes. 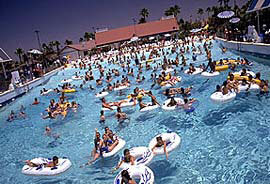 It's of course 'way less fun than floating down the Salt River, but for an amusement park it was terrific. Zach's mom Jenny made it all come together. Jenny had been there before, and insisted I accompany her on a more challenging waterslide called "The Cauldron", which had a height restriction (no one under 48" tall) and a swimming requirement (it drops you into a nine-foot-deep pool, so you have to be able to swim out of it). None of the other adults were interested; Zach wanted to ride it but the other kids were too timid. So Jenny, Zach and I climbed the interminable stairs and waited…and waited…and waited. The line wasn't long, but only one person can go down at a time and the next person can't start until the previous one has climbed out. So we sang along to '70s songs (Beach Boys, etc.) and got to know our neighbors in the line, who were mostly in their very early twenties and tattooed and pierced until they were a hair's breadth from unraveling completely, entirely too well. Finally it was our turn. Jenny went first, then Zach. The top part is an enclosed water slide with lots of water. You are required to go in feet first, keeping your feet together, and with your hands clasped behind your head. Apparently this pose reduces the odds that you will break a leg or arm during the descent. The enclosed slide is like being flushed down a winding pipe. And it does wind. You go back and forth, up and down, and despite the water your back definitely can feel the ribs where the sections of slide are attached. Finally, you feel as if you are being poured upward, though this is just a trick of inertia…I think. That spits you into the cauldron itself, where you get flushed around and around until you finally fall through the hole in the middle into that nine-foot pool. It was fun, but once was enough. We also spent some time in the Wave Pool, a large, lake-like pool (complete with a very gradual, beach-like shore) that, every ten minutes, is hit by a series of waves emanating from the deep end. To say the pool was crowded would be an understatement, but I guess that's all part of the fun. We got there about 12:30 and didn't leave until 5, the last half hour being spent eating ice cream. Finally we got home with just enough time for Zach's birthday cake before the parents came for their kids. In short, a good time was had by all. Left to right: Jenny's hair, Chris, Mary (grandma), Zach, Nick, Jason, and Tony.